It’s still possible for Athens and its lenders to reach a deal on a €7.2-billion bailout this week, said Germany’s EU Commissioner Guenter Oettinger, as the June 5 payment deadline looms and talks have so far yielded no results. "We will need progress at the working group level, in order that we can agree on a reform agenda, perhaps even by the end of the week, which would trigger the payment of the last tranche of aid from the current aid program," the commissionertoldDie Welt in an interview published Monday. 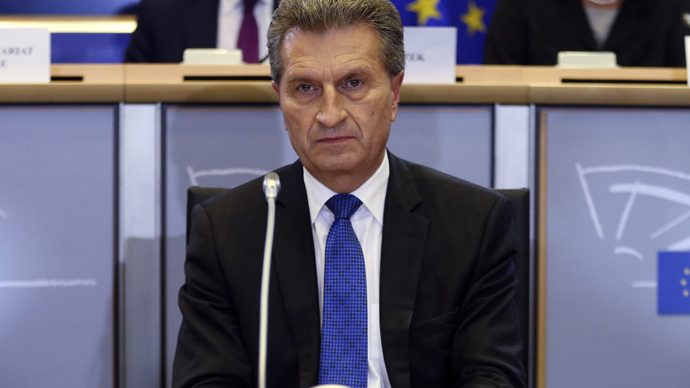 The 5-month negotiations have seen progress when it came to reforms such as value-added tax, but vital issues such as the labor market and the pension system are still in stalemate, Oettinger added. German Chancellor Angela Merkel, French President Francois Hollande and EU President Jean-Claude Juncker are unlikely to reach an agreement on the Greek question at a meeting in Berlin on Monday, as it’s too complicated to be solved at the drop of a hat, said Oettinger. The statement comes as the clock is ticking for Greece to make its next €300-million repayment to the IMF on June 5, one of four tranches totaling almost €1.6 billion, due next month. Greece had to empty an emergency IMF holding account to repay €750 million due in May. This is a holding account used for emergencies, but the cash can only be doled out with the lender’s approval. Greece is trying to reimburse its multibillion euro debt to the troika of international lenders – the IMF, the ECB and the European Commission, and agree its reform plan with lenders. Athens has already missed a self-imposed Sunday deadline for reaching an agreement on the bailout as Greece and its lenders are continuing their cash-for-reforms talks. Last week, a number of top officials made controversial statements about Greece and its five-month negotiations with the lenders. On Sunday, Greek Prime Minister Alexis Tsipras accused creditors of making ‘absurd proposals’, which resulted in five months of fruitless talks. The country, which aims to stay within the eurozone, is answered with indifference, he added. Greek Economy Minister George Stathakis said on Friday Athens would be able to scrape together the €300 million through internal resources, the way it was done in the past year. That's after Greek Interior Minister Nikos Voutsis said at the end of May the country wouldn’t be able to pay the installment to the IMF on June 5 unless it received additional financial aid from creditors. IMF Managing Director Christine Lagarde said last week there was "still a lot of work to do" to settle the Greek issue.